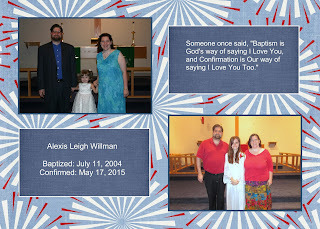 My niece, our God-daughter Alexis got Confirmed last Sunday. I can't believe she's so old, so mature, she's going to be a Freshman in high school next fall. We joined the Fam in the Church Service to see her Confirmed. It's amazing to me that the Lutherans do Confirmation Class for 3 years! That's a lot of learning about our Faith. I grew up Presbyterian, and our class was one semester, every Saturday in high school, and that was enough for me. 3 years is some kind of Devoted learning! Welcome to the newest members of the Church! Alexis and her Confirmation class, she is on the far right. Silly Sweetgirls! Yeah, in some ways, she's still a child. But she's ours. We love her so. It's all our fault that Amy and Jeremiah didn't make it to the Confirmation, they got a stomach bug that Jacob had that I didn't know he had until he started puking the day after we saw them. I was so sorry. But Sam had been home sick the day before we saw them, and I didn't think he was really sick, since he often pukes in the morning when he just doesn't eat dinner. In this case, it was more than just not eating dinner. Call me Typhoid Cathy. The Confirmand and her Grandparents, both sets. All the Confirmands and their cake. We all wore red too, for Pentecost Sunday. I asked for a photo shoot with Alexis, to show how she has grown, both literally, and in Faith. 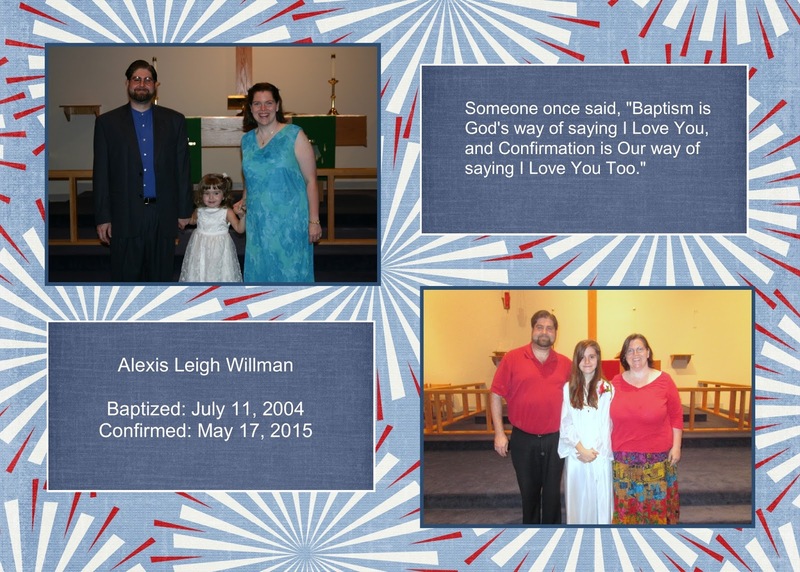 I made a Scrap page to commemorate, showing what our little lady looked like on the day she was Baptized, and now at her Confirmation. My how she has grown! I can't wait to see what her Faith and the Future bring. Epic Vacation, Day 2 - Holiday World!